The latest effort in the fight to retain the sleeper train to Penzance will be launched at the Eden Project this weekend. A special support group says it will try to ensure the service is fully booked for every trip. The Save our Sleeper campaign says it now wants to concentrate on efforts to secure and develop the service. The Department of Transport says the sleeper runs at a loss and gets a £5m subsidy every year. 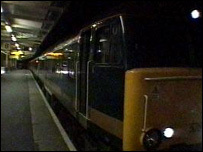 This has led to concern the train could be axed when the winner of the new rail franchise is announced next month. The support group already has the support of Cornish MP's and leading business people including Lord George of St Tudy - former governor of the Bank of England.